Big emotions. Grand escapades. Moments that have brought you to the brink of despair. Parenting a gifted kid is a far-from-normal experience. It’s an absolute adventure, exhilarating and worth it in the end. (Many thanks to guest author Kristi Denoy from the Hail Marry Blog). In the classroom, I’ve been around my fair share of kiddos. From student teaching, actual time in the classroom, and Faith Formation classes at church, I’ve taught every grade from first to high school seniors. These kids have been high achievers, special education of all types, average, unchallenged in their workload, challenging to teach, and gifted. The gifted students were always my biggest challenge, in terms of meeting their needs. But I like a good challenge. 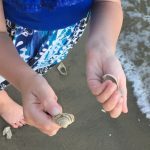 As a parent, I have a gifted one-month-shy-of-nine-year-old daughter and a two-month-old baby girl who is breaking milestone expectations already. Our pediatrician, who is very gifted child-friendly, suspects the baby will share her sister’s unique biological programming (though we both know it’ll be a whole different ballgame). 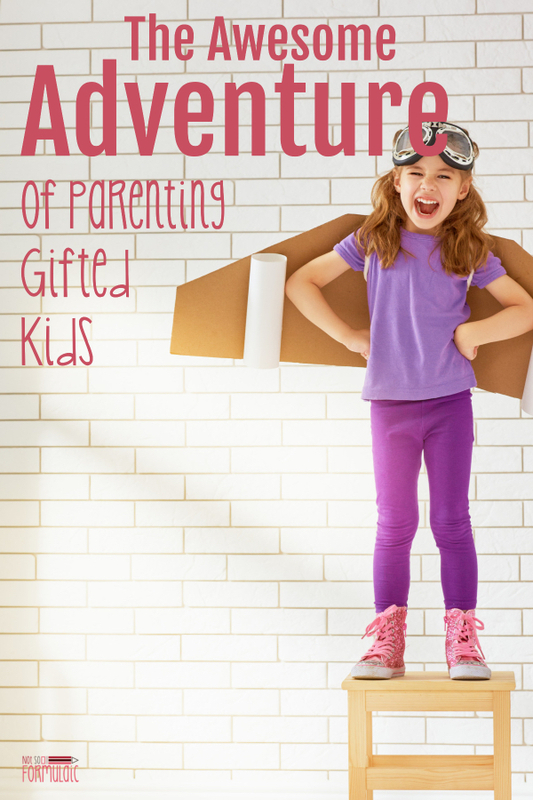 Parenting gifted kids and teaching them are two similar yet simultaneously different beasts; and while parenting one (or more), too, is challenging, mostly it’s an adventure. Adventure, though, can be subjective. Allow me to elaborate. Parenting anyone means that you’re handed the huge honor of teaching a child how to be an adult. That, in itself, is an adventure, but it’s more like a guided safari of a carefully crafted jungle scene in the Animal Kingdom. A child may not come with a manual, but there are timed milestones developmentally—socially, emotionally, and physically—that you can count on as a guide for how you’re doing. Just as you know what’s coming because the safari tour guide says, “If you look to the left, you’ll see…” you know what’s coming because your child hits the right marks at the right time. Not so with a gifted baby. Lewis Carroll, author of Alice’s Adventures in Wonderland and Through the Looking Glass wrote, “The adventures first, explanations take such a dreadful time!” I love this. So much. 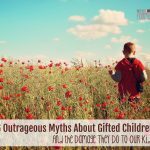 Gifted kids are just wired differently (thanks, asynchronous development!) and they have their own timelines and schedules. Unlike the guided tour above, it’s more like a self-led trek through the actual African jungles, dodging lions and stampeding gazelle while also admiring the unique formation of this one particular termite mound as a rhinoceros charges you. My daughter is extremely compassionate and she feels empathy almost as if it were a sixth sense. She is justice-minded, as well, and constantly concerned with fairness. She physically gets agitated when she sees a piece of litter. She reads well above her grade-level and comprehends it exactly. She also cannot grasp spelling patterns to save her life. She can work out a complex math word problem accurately but hasn’t reached fluency in her math facts. She understands the basics of quantum physics (thanks to a brainy uncle, not this mama!) but struggles with concepts that kids who usually struggle quickly grasp. She can have a conversation with you and you’d think she held a bachelor’s degree, but she also still enjoys some of Disney’s pre-school programming. Her unique makeup makes parenting her a Broadway musical number. Only, sometimes it’s a waltz from the Golden Age of Broadway, or a ballet sequence from An American in Paris, or a cheerleading number from Bring it On! The Musical (yes, that’s a thing). And you never know which one it is until you’re a few steps in. It definitely keeps you on your toes. Still, I love the way her mind works. In reality, it never shuts off, which can be utterly exhausting for her. As her mom, it’s like experiencing everything anew, through her eyes. Sure. There are moments where my nine-year-old throws a tantrum like she was a three-year-old. While not something we condone, it’s usually because she’s overstimulated. 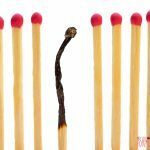 Sometimes, something that worked to motivate, calm, or discipline her yesterday fails miserably the next. But working with her to work through it is also an adventure. For extracurricular activities, she loves Chess Club, dance, and Bible study. She dreams of being a ballerina and dancing with Tiler Peck in the New York City Ballet. She is extraordinarily critical of herself and is never good enough. For her. 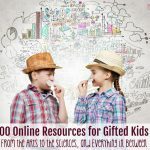 I’ve found that gifted children are often perfectionists. Not only does everyone perceive them as perfect (meaning they feel they are not allowed to mess up or it’s the end of the world), they see themselves as both needing to live up to that perception while being unable to ever be good enough to live up to that same perception. That is exhausting as a child. Parenting that is also exhausting. 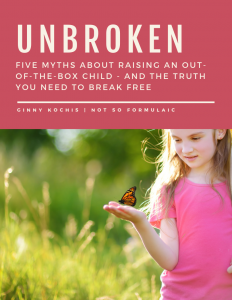 Parenting a gifted child also means that I parent the empath I referenced earlier. While that does come with struggles to navigate the waters of intense emotions, it also comes with a capacity for love and kindness that is unmatched. 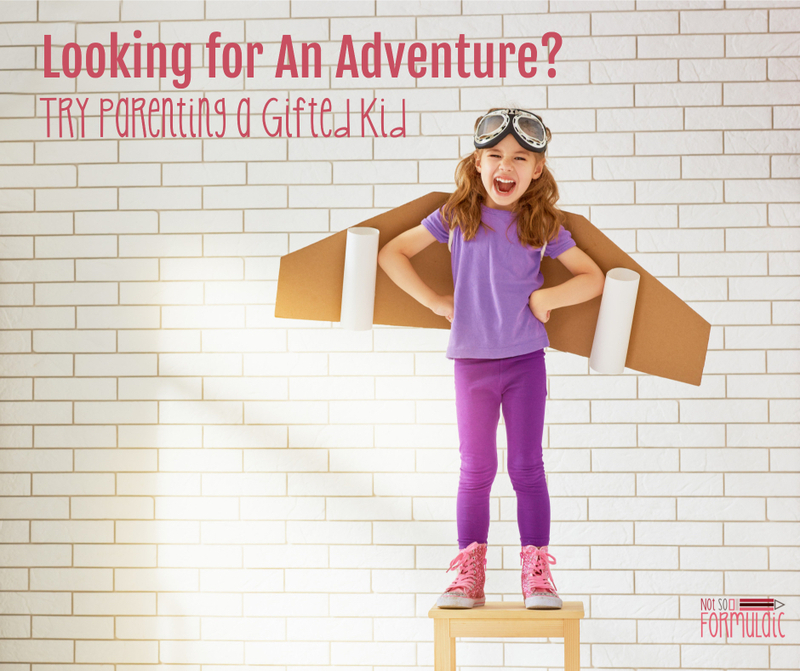 In my experience, gifted kiddos are some of the most generous people populating this world. With my daughter, that means that I get extra cuddle time—in that she wants to cuddle beyond when her friends want to stop with their parents and for longer intervals. It means that we get into deep conversations that lead to excellent discoveries and make for great memories. 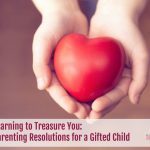 I look at having a gifted child (perhaps children) as a gift to me as a parent. It keeps me on my toes and is hard work, but I also find that the hardest work yields the greatest fruits. We only have our kids for such a short time. Think of that time as an adventure. After all, our kids will grow into what we help them cultivate now. Let’s cultivate that sense of adventure in them. 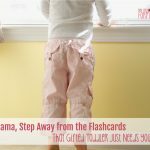 Each struggle overcome, each problem encountered, and each memory made is a stamp in our parenting passport. Kirsti Denoy is a Texan by birth and breeding. She loves the smell of rain in the summer, firewood burning, and the combination of books and coffee. When she’s not hanging out with her family or blogging at Hail Marry, she’s probably being an office manager extraordinaire at work. Connect with Kristi on Facebook, Instagram. Twitter, and Pinterest. Omg! I’ve never quite seen anyone describe day to day life with my little. Thank you for putting this in to words. Not alone at all! The gifted parenting online community is so valuable. This was very interesting. I often wonder if I was a “gifted” child but it was never really addressed. People would tell my mom I was too sensitive b/c I’d cry/get upset easily and then tell her how much harder girls are to raise than boys. You may have been! There’s a book – I’ll track down the title and share it in the group. But it’s about discovering your giftedness as an adult. It’s on my reading list for sure.